Nissan Rental Cars located at Ken Garff Nissan Riverdale offers the hottest new Nissan models available in Salt Lake City, making it a superior rental experience. Whether your rental needs are for pleasure, business or special events, Nissan Rental Cars provides the superior quality available only at Nissan. We offer personalized customer service, competitive rates, and an opportunity to rent the latest Nissan models. Make it Ken Garff Nissan Riverdale for all your rental needs! Service Replacement Vehicles – Drive away in the hottest new Nissan models available while your vehicle is being serviced. Insurance Replacement Vehicles – Is your vehicle being repaired at a local Body Shop? Ask us about a Nissan Rental Car as a temporary replacement vehicle. Try before you buy – Test-drive a new Nissan model before your next lease or purchase. Enjoy a long weekend getaway in a current Nissan model. Prices start as low at $35/day and rental vehicles include the hottest Nissan vehicles from an Altima, Murano or Armada. 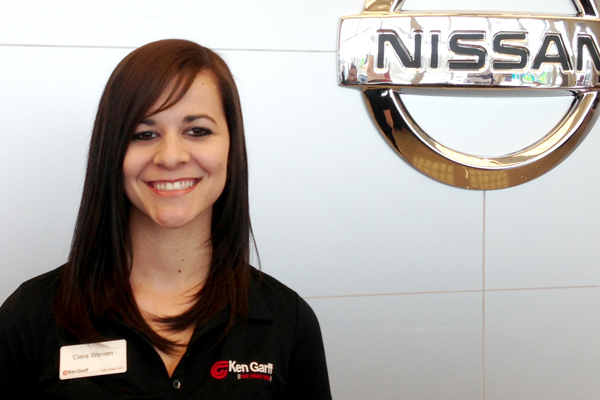 Contact Ciera Werven our rental car manager for all your Nissan rental needs at (801) 781-4500.